This article is about the city. For the river, see Pasig River. Pasig, officially the City of Pasig, (Tagalog: Lungsod ng Pasig), or simply known as Pasig City, is a 1st class highly urbanized city in Metro Manila, Philippines. According to the 2015 census, it has a population of 755,300 people. 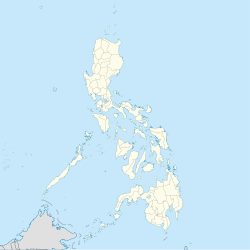 Located along the eastern border of Metro Manila, Pasig is bordered on the west by Quezon City and Mandaluyong; to the north by Marikina; to the south by Makati, the municipality of Pateros, and Taguig; and to the east by the municipalities of Cainta and Taytay in the province of Rizal. The city shares its name with the Pasig River which runs through it and forms its southwestern and southeastern borders with Makati and Taguig respectively, while the Marikina River forms its western border with Quezon City. The artificial Manggahan Floodway, built in 1986, begins at its confluence with the Marikina River in its northeast. A formerly rural settlement, Pasig is primarily residential and industrial, but has been becoming increasingly commercial in recent years, particularly after the construction of the Ortigas Center business district in its west. The city is home to the Roman Catholic Diocese of Pasig, based in Pasig Cathedral, a landmark built around the same time as the town's foundation in 1573. Pasig was formerly part of Rizal province before the formation of Metro Manila, the National Capital Region of the country. The seat of government of Rizal was hosted in Pasig at the old Rizal Provincial Capitol until a new capitol was opened in Antipolo, within Rizal's jurisdiction in 2009. However it remains the de jure, or official capital of the province. The city's name Pasig was believed to have come from the old Sanskrit word "pasega", meaning "sand" (similar to Malay pasir), which refers to the tribal community beside the sandy edges of the river. Some historians believed that El Pasig came from "Legazpi" (Miguel Lopez de Legazpi, the Basque explorer well known for being involved in the "Sanduguan", and was the first Governor-General of the Spanish East Indies. It was pronounced "mapaksik" by the Pre-Hispanic Chinese inhabitants of Binondo, Manila ("Mabagsik" is Tagalog for "terrifying" - depicting the river's raging current during the typhoon season, causing massive floods on nearby towns and villages, destroying wide hectares of farmland, and even bringing huge amounts of logs and water lilies from Marikina River, Laguna de Bay, and San Juan River towards Colonial Manila). "Mapaksik" later became "Pah-sik", and was then changed to what is now "Pasig". It may have also come from the Tagalog word "dalampasigan", which means "riverbank". According to Jose Villa Panganiban, the former director of the Institute of National Language, "Pasig" is another ancient Sanskrit word meaning "a waterway coming from one body of water to another," which briefly describes the river because its flow starts from Laguna de Bay, leading to Manila Bay. The dry season runs through the months of November to April, while the wet season starts in May and lasts to November. The wet season reaches its peak in the month of August. Maximum rainfall in Muntinlupa usually occurs from the month of June to September. The average annual of rainfall is 2,014.8 millimeters with a peak of 420.0 millimeters in July and a low 26.9 millimeters in April. The highest temperature occurs during the month of April and May (34 degrees Celsius) while the lowest occurs during the months of January & February (24 degrees Celsius). There are no surviving firsthand accounts of the history of Pasig before Spanish colonizers arrived in 1573 and established the settlement which they called the Ciudad-Municipal de Pasig. However, surviving genealogical records and folk histories speak of a thriving indigenous community (Barangay) on the banks of the Bitukang Manok river (now nearly extinct, and known as Parian Creek), which eventually became modern-day Pasig. The greatest rulers of this pre-colonial polity are named Rajah Lontok and Dayang Kalangitan by the legends, which also say that they are closely related to the pre-colonial rulers of Tondo and Maynila. The creek was given the name "Bitukang Manok" (Tagalog for "Chicken Gut"), due to the serpentine shape of its waterway. Among its early dwellers were Ethnic Malays, the Chinese from Southern China (with their origins dating back from the Ming Dynasty), and the Indigenous Tinguian nomads who migrated from the deep jungles of the Sierra Madre Mountain Range. The Bitukang Manok was once a principal tributary of the Marikina River. 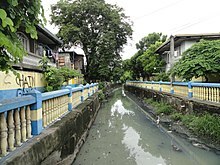 The Spanish colonizers called the creek "Rio de Pasig"; however, the natives still referred to it as the Bitukang Manok. The first stretch of the Bitukang Manok became known as the "Pariancillo" (Estero de San Agustin), where its shoreline was once settled by Chinese and Malay merchants to trade their goods with the natives, until it developed up to the 1970s as the city's main public market. Likewise, the creek contributed enormously to the economic growth of Pasig during the Spanish Colonial Era, through irrigation of its wide paddy fields, and by being the progressive center of barter trade. The Bitukang Manok, also known as the "Parian Creek", had once linked the Marikina River with the "Antipolo River". Before the Manggahan Floodway was built in 1986, The Parian Creek was actually connected to the Sapang Bato-Buli Creek (which serves as the boundary between Pasig's barangays Dela Paz-Manggahan-Rosario-Sta. Lucia and the Municipality of Cainta), the Kasibulan Creek (situated at Vista Verde, Brgy. San Isidro, Cainta), the Palanas Creek (leaving Antipolo through Brgy. Muntindilao), the Bulaw Creek (on Brgy. Mambungan, besides the Valley Golf and Country Club), and the Hinulugang Taktak Falls of Brgy. Dela Paz (fed by the Taktak Creek passing close to the Antipolo Town Square), thus being the detached and long-abandoned Antipolo River. The Sepoys backstabbed their abusive British lieutenants and sided with the combined forces of the Spanish Conquistadors (assigned by the Governor-General Simon de Anda y Salazar), local rice farmers, fisherfolk, and even Chinese traders. After the British Invasion, the Sepoys remained and intermarried with Filipina women, and that explains the Hindu features of some of today's citizens of Pasig, especially Cainta and Taytay. In 1742, an Augustinian friar named Fray Domingo Diaz, together with a group of wealthy "Mestizos de Sangley" (Chinese Mestizos) from Sagad, ordered a construction of a marble, roof-tiled cover bridge across the creek in the style of an oriental pagoda. It was named "Puente del Pariancillo", and a few years later, it changed to "Puente de Fray Felix Trillo", dedicated to the dynamic parochial curate of the Immaculate Conception Parish. Edmund Roberts visited Pasig in 1832. On the night of May 2, 1896, more than 300 revolutionary Katipuneros, led by the Supremo Gat. Andres Bonifacio, Emilio Jacinto and Pio Valenzuela, secretly gained access in this very creek aboard a fleet of seventeen "Bangkas" (canoes) to the old residence of a notable Valentin Cruz at Brgy. San Nicolas, and formed the "Asamblea Magna" (mass meeting). Three months later on Saturday evening, 29 August, about less than 2,000 working-class Pasigueños (along with a hundred Chinese "Trabajadores" (laborers) from the failed Sangley revolts of 1639 and throughout the 17th century), armed with coconuts, machetes and bayoneted muskets (some were donated by the rich Ilustrado families, while many of those guns were looted from Spanish authorities), joined the Katipunan and made a surprise attack at the "Municipio del Gobernadorcillo" (the current site of the Pasig City Hall) and its adjacent garrison of the "Guardias Civil" (Civil Guard), situated near the border of barangays Maybunga and Caniogan. Guanio residence, the site of the "Nagsabado sa Pasig." That was the first and victorious rebellion ever accomplished by the Katipunan, and that particular event was popularly known as the "Nagsabado sa Pasig" (the Saturday Uprising on Pasig). After they had managed to successfully out-thrown the seat of Spanish government on Pasig, the Katipuneros fled immediately and advanced towards a "Sitio" located at the neighboring "Ciudad de San Juan" called "Pinaglabanan", and there they launched their second attempt to end the numerous cases of corruption made by the greedy Castilian "Encomenderos" (town officials) and "Hacienderos" (landlords), which shall be commemorated as the Battle of San Juan del Monte. On June 11, 1901, during the Philippine-American War, the province of Rizal was created through Act No. 137 of the Philippine Commission. Pasig was incorporated into the province of Rizal, and was designated as the capital of the new province. In 1975, Pasig was carved out of Rizal province and became part of Metro Manila when the Metro Manila Commission (precursor of Metro Manila Authority and later Metropolitan Manila Development Authority) was created by Pres. Ferdinand Marcos through Presidential Decree 824. A section of the Bitukang Manok. After World War II, the Bitukang Manok was slowly exposing its ecological downfall. It resulted in water pollution due to rational ignorance. The worst came to the Bitukang Manok in the late 1960s when the disappearing waterway, instead of being revived was totally separated from the Marikina River, and was converted into an open sewage ditch, with its original flow now moving in reverse towards the direction of the Napindan Channel (a portion of the Pasig River bordering between the barangays Kalawaan-Pinagbuhatan and Taguig), to give way to public commercial facilities. On February 4, 2006, the ULTRA Stampede, in which 71 people died, happened during the first anniversary celebration of ABS-CBN's noontime show Wowowee, because of the prizes that were to be given away. The anniversary of the show would be held on PhilSports Arena but the event has been already canceled due to the tragedy. Pasig was one of the areas struck by the high flood created by Typhoon Ondoy on September 26, 2009, which affected the Ortigas Avenue and the east city side of the Manggahan Floodway. It is the most destructive flood in Philippine history. Pasig is accessed by the Pasig River, wherein the waters of Marikina River channeled and the Manggahan Floodway routed to Laguna de Bay. In the first week of August 2012, intense monsoon rain caused the 2012 Philippines flooding, which affected again Pasig and particularly the National Capital Region (NCR), CALABARZON and the southwest part of Luzon. The nonstop eight-day monsoon rain, strengthened by Typhoon Gener, caused the Marikina River to overflow and destroyed the same places that were ruined by Typhoon Ondoy in 2009. Pasig is governed primarily by the city mayor, the vice mayor and the city councilors. The mayor acts as the chief executive of the city while the city councilors act as its legislative body. The vice mayor, besides taking on mayoral responsibilities in case of a temporary vacancy, acts as the presiding officer of the city legislature. The woman represents the Mutya ng Pasig. Pasig is derived from a Hindu word meaning a body of water connecting two bodies of water. On the lower left portion is the Pasig Cathedral, the seat of the Roman Catholic Diocese of Pasig. The factory in lower right portion represents the prosperity and progress of the city. Pasig is politically subdivided into 30 barangays. Its barangays are grouped into two districts for city council representation purposes. The first district encompasses the southern and western sections of the city, while the second district encompasses the northern and eastern sections. Among these barangays, 27 are located on the northern side or right bank of the Pasig River while 3 (Buting, San Joaquin and Kalawaan) are located on the river's southern side or left bank. ^a Excludes 7,296 persons residing in the area disputed by Barangay San Isidro, Cainta, Rizal. ^b Includes population separately enumerated in the 2007 Census as Barangay Napico. Its creation was annulled by the Supreme Court on September 10, 1999. Excludes 3,784 persons in the area disputed by Barangay San Isidro, Cainta, Rizal. Population growth of Pasig has consistently been higher than the regional average. Thus, the percentage share of Pasig in the total population of Metro Manila has significantly increased. Its share has grown from less than 3% in 1960 to 4.5% in 1980 and then to almost 6% in 2015. Pasig's population is projected to reach one million between the 2025 and 2030 census years. The Roman Catholic Diocese of Pasig was established in 2003 by Pope John Paul II as the diocese of the Catholic Church in the Philippines, with the Immaculate Conception Parish (Pasig Cathedral) as the seat. Pasig is the headquarters of the Presbyterian Church of the Philippines. Historically, Pasig produced rice, fruit and sugarcane. The western part of the city is where most of Pasig's financial resources are primarily concentrated. It includes numerous factories, warehouses, establishments and commercial facilities. Primarily they situated in the Ortigas Center, Pasig proper and along E. Rodriguez Jr. Avenue (C-5) and Ortigas Avenue. Real estate and commercial developments along Mercedes Avenue and other areas near the city center are developing. The eastern part was mostly dominated with residential areas but numerous commercial establishment are now developing along Marcos Highway. Per capita income (GDP) of Pasig is $12,032 per year. The barangay of San Antonio has the largest income in Pasig, second only to San Lorenzo of Makati as the largest single income-generated government unit in the Philippines. In the arguably more significant western part of Pasig, east of the city of Mandaluyong and as part of the barangay of San Antonio, lies the Ortigas Center. The Ortigas Center is one of the top business districts in the country, numerous high-rise office buildings, residential condominiums, commercial establishments, schools and malls are situated here. The University of Asia and the Pacific is located here. The head office of the Integrated Bar of the Philippines was also established here. The headquarters of the Philippine Stock Exchange, which is also home to one of trading floors of the country, is located along ADB Avenue. The headquarters of San Miguel Corporation, owner of one of the largest producer of beer in Asia, is located along San Miguel Avenue. Situated along Ortigas Avenue lies the Crowne Plaza, a five-star hotel near Robinsons Galleria. Notable along Ortigas Avenue and E. Rodriguez Jr. Avenue (C-5) lies Frontera Verde, a newly privately owned development area which includes restaurants, pet shops, mall, park, village, office buildings and a small zoo. The shopping complex Tiendesitas was located here, a one spot hub that can rival the world-renowned Chatuchak market of Bangkok, Thailand. El-Pueblo, a colonial-themed commercial complex in Ortigas Center, provides new concept of cafes, restaurants and bars. Metrowalk (formerly Payanig), a commercial hub along Ortigas Avenue and Meralco Avenue, was established in 2005 near Ortigas Center which comprises shops, depot warehouses, stalls, restaurants and bars. As of 2012, the revenue of the city totaled ₱7.22 billion. Along C. Raymundo Avenue lies the national headquarters of Parents for Education Foundation, Inc. which runs schools such as PAREF Southridge School, PAREF Woodrose School, PAREF Northfield School, PAREF Rosehill School, and seven other schools. At the heart of city proper, lies Colegio del Buen Consejo (CBC). It is one of the oldest school in Pasig and one of the educational institutions promulgated by the Roman Catholic Diocese of Pasig. Pasig Catholic College (PCC) is a private sectarian college located at the heart of Pasig. Established in 1913 as a small school managed by the CICM Fathers headed by Fr. Pierre Cornelis De Brouwer at the present Immaculate Conception Cathedral of Pasig, it is considered as the city's center of Catholic educational institution of the Roman Catholic Diocese of Pasig. Pasig City Science High School (PCSHS) is the second science high school in Pasig recognized by the Department of Education for bright students of the city. It is located near Rainforest, a fully restored public resort and amusement park. Rizal High School (RHS) is located in Pasig. Named after the Philippine national hero José Rizal, it is one of the world's largest secondary education by student population. Formerly hailed in the Guinness World Records as the largest school by overall enrolled students, it is now surpassed by the City Mississippi School (CMS) in Lucknow, India. Pamantasan ng Lungsod ng Pasig, a local university in Kapasigan, offers degree courses for poor, bright and deserving residents of Pasig. It is established under the mayoralty of Vicente C. Eusebio in 1999. St. Paul College Pasig was near the Philippine Institute of Sports Complex (ULTRA). It was established in 1970 as one of the educational institutions administered by the Congregation of the Sisters of St. Paul of Chartres. University of Asia and the Pacific (UA&P) in Ortigas Center traces back to the Center for Research and Communication (CRC) which started by two Harvard graduates in 1967 as an economic and social think-tank institution. Its spiritual and doctrinal formation is entrusted to Opus Dei. MFI Foundation Inc. (formerly Meralco Foundation Institute) was located near the Ortigas Center along Ortigas Avenue. It is established in 1983 to serve and meet the industry's demand for middle-level technical manpower. As a partner of Philippine government's institution of the Technical Education and Skills Development Authority (Philippines) or TESDA, it provided two main programs in the Industrial Technician Program (ITP) which targets the youth and the Technical Training and MFI Training (formerly Testing Program) for skilled workers and professionals. Domuschola International School (DIS) is located in Barangay Ugong and offers the International Baccalaureate PYP program for elementary students. Established in 2000 as a pre-school under the name Second Mom, it has expanded to primary and secondary education. The school is in partnership with the TAO Corporation and as of 2015, became a candidate school of the IB Diploma Program. Saint Gabriel International School in Sandoval Avenue is the sister school of the Chinese-based Manila Xiamen International School. It provides Mandarin Chinese classes and ESL education for local and foreign students. PhilSports Complex or the Philippine Institute of Sports Complex (formerly ULTRA) is a notable national sports complex of the Philippines. Located in Meralco Avenue, it is where the offices of the Philippine Sports Commission, Philippine Olympic Committee and some national sports associations are. Pasig will host some matches at the 2023 FIBA Basketball World Cup at the PhilSports Arena. Dr. Sixto Antonio Avenue is a major north–south road in Pasig. This city is also served by Santolan Station of Line 2 along Marcos Highway located in Pasig-Marikina Boundary where the depot is also located. Long before the Manila Light Rail Transit System finally opened its services in Santolan in the Pasig-Marikina border in the early 2000s, Steam train services had once served those places in the past, even before World War II. In Marikina, there is a street named "Daangbakal", also called by the names of "Shoe Avenue Extension", "Munding Avenue" and "Bagong Silang". There is also a similar "Daangbakal" in the San Mateo-Montalban (Rodriguez) area, and on the maps one can notice that the two roads should have been connected with each other. In fact, as the name suggests in Tagalog, these streets were once a single railway line. The two sides of the "Daangbakal" roads were once connected by a bridge in the San Mateo-Marikina border. However, as the railroad tracks have been largely ignored after the Japanese cccupation and was transformed into separate highways, the railway connection was abandoned. The old railroad tracks, called the Marikina Line, was connected from Tutuban station in Manila, passing through Tramo (Brgy. Rosario, Pasig) coming all the way to the town of Marikina up to Montalban. On the northern end of the "Daangbakal" road in Montablan is a basketball court. That basketball court which stands today, surrounded by the Montalban Catholic Church and Cemetery, was once the railway station terminus of that particular line. The Marikina Line was completed in 1906, and continued its operation until 1936. It was said that the Imperial Japanese Army made use of this railway line during the Second World War. These railways were dismantled during the 1960s and were converted into ordinary roads. Aside from the Marikina Line, two other railways have existed before but are now removed permanently. Candaba, Pampanga, a place where there is a barangay named Pasig. Balabac, Palawan, a place where there is a barangay named Pasig. Lambunao, Iloilo, a place where there is a barangay named Pasig. Sara, Iloilo, a place where there is a barangay named Pasig. ^ "THE NEW RIZAL PROVINCIAL CAPITOL". Rizal Provincial Government. Retrieved 23 January 2018. ^ Scott, William Henry (1984). "Societies in Prehispanic Philippines". Prehispanic Source Materials for the Study of Philippine History. Quezon City: New Day Publishers. ISBN 978-9711002268. ^ a b Roberts, Edmund (1837). Embassy to the Eastern Courts of Cochin-China, Siam, and Muscat. New York: Harper & Brothers. p. 60. ^ "Philippine Republic Act No. 7926, Articles III, IV, V". Chan Robles Virtual Law Library. Retrieved 11 Dec 2008. ^ Mercurio, Richmond S. "Philippine cities with over 1M population to nearly triple by 2025". Philippine Star. Retrieved 6 April 2017. ^ "US-Asia Sister Cities by State". Asia Matters for America. Honolulu, Hawaii: East West Center. Retrieved 4 February 2015. ^ "Pasig City, Philippines & South San Francisco, California". Washington, D.C.: Sister Cities International. Retrieved 4 February 2015. Wikimedia Commons has media related to Pasig City. Wikivoyage has a travel guide for Pasig.